Concerned Women for America of Iowa State Coordinator Denise Bubeck, Concerned Women for America of Wisconsin State Director Kim Simac, and many other activists opposing the Common Core State Standards (CCSS) attended a joint hearing on May 22, 2013, at the Wisconsin State Capitol. 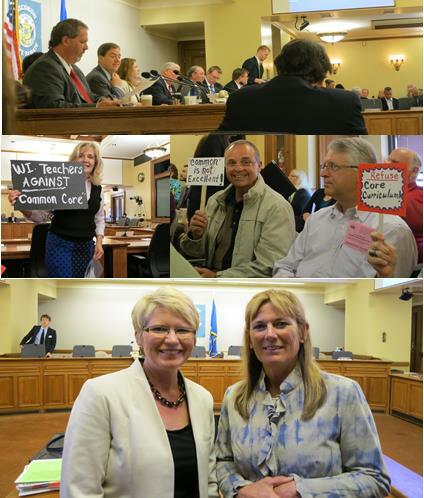 Wisconsin senators and Assembly members held a public hearing on the Common Core State Standards. Proponents of the Common Core State Standards, trying to justify the implementation of the CCSS without any input or response from the public, stood on the argument that these standards were much higher than the original Wisconsin state standards. Opponents of the Common Core State Standards voiced concerns on how the CCSS will take away local control and increase the federal government’s involvement in what should be a local and state issue. They also argued that the CCSS have not been tested, and they comes with a high price tag. Dan Thatcher, a policy specialist at the National Conference of State Legislatures, claimed he knew of no entanglement in the initiative by the federal government. Joy Pullmann of the Heartland Institute stated, “Estimates of the Core’s phase in cost vary from $3 billion to $ 16 billion nationwide.” The hearing on Wednesday, May 22, was slated before the Joint Finance Committee meeting where deliberations on funding the Common Core would take place. The Thomas B. Fordham Institute Policy Fellow Kathleen Porter-Magee went on to assure the Education Committee members that: “By choosing the Common Core, Wisconsin has dramatically boosted the quality, clarity, and rigor of it expectations in these two critical areas” (English/Language Arts and Math). It’s curious how they can be so confident when the CCSS have no track record. Two district superintendents spoke in favor of the Common Core Standards both applauding that now educators have the “what” to teach and they can do the “how”. Neither superintendent seemed alarmed about the cost of the implementation of the curriculum or the testing, knowing full well that the testing will be done online which will increase the technology needs of each school. They were not alarmed that the implementation of these standards takes away the right to opt out of any standard, and a district is limited to only adding up to 15 percent of its own standards. Looking further down the road, it seems that state legislators would be alarmed at all of the costs that will be added to their education budget. The centralizing of education further taking away our rights under the 10th amendment of the U.S. Constitution should also be alarming. Legislators questioned the data collection on each student, but the Department of Instruction representatives clearly stated that each data point collected is protected. We believe that cannot be true because in the Administration’s Stimulus Bill in 2009, the State Fiscal Stabilization Fund was created for states to build broad state longitudinal data systems (SLDS) to collect data on public school students. To be eligible for Stimulus money, all fifty states agreed to build an SLDS. The federal privacy law of 2012 protected personally identifiable information (PII) from disclosure. The proponents of the CCSS did not mention that new regulations allow transmission of PII without parental consent. When DPI officials were questioned on how aggressive the federal government was on wanting this data, they were noncommittal in their answers. The take away from this hearing is that legislatures have a lot to learn concerning the Common Core. Proponents have been given concise talking points to counteract any questions or concerns raised by opponents. The grassroots’ involvement is essential to stopping this long arm of the government in the K-12 educational system. Joy Pullmann of the Heartland Institute clearly stated, “The public’s lack of knowledge is troubling because what is taught in public schools is of fundamental importance to the country’s democracy, individual freedom, and prosperity” (quoted from Joseph Bast). Karen Schroeder, from Advocates for Academic Freedom, gave testimony to the joint session that parents who become involved in local schools are told that “District policy on this issue is compliant with state and federal statutes.” Karen Schroeder warned parents that Common Core State Standards will affect all school choices parents make. Karen Schroeder testified at the CCSS public hearing and stated in her blog, “The website under Bob Jones University’s Iowa Test of Basic Skills boasts that their texts and testing materials align with CCSS and other state and federal standards. Bob Jones University provides those supplies to Christian and home school settings.” The CCSS will have a monumental effect on all approaches to education. Concerned Women for America of Iowa will stand with citizens across the state and country to stop the Common Core State Standards. To join us in these efforts, please consider the following: Contact us at 515-259-0087 or info@iowa.cwfa.org for copies of the brochure Stop Common Core “State” Standards or to purchase for $10 a DVD on the Common Core.